Quick Sketch. Thanks for all the comments guys! Awesome Phant Benzo......but where's the funny anecdote????? Did someone pee on your sugar sandwich this morning or what? Great looking elephant, Ben! I always love your sketches. Great stuff! you're an awesome designer man. I'll be sure to come back for more goodies as well, cheers! 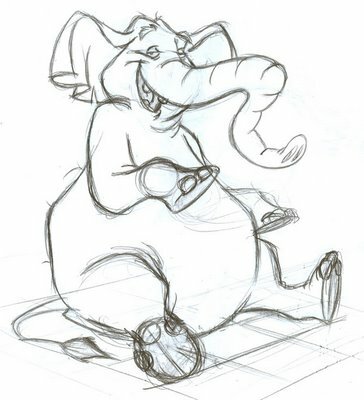 thats one mighty fine elephant Ben!!! Love the weight to thi guy! Dig those elephant teeth, man. Great sketch! nice man!...looks like yer workin hard. Great sketch. I like the way he's laughing. Ben try drawing something weak for one, Ben. Come on! I dare ya! I'm writing this in the hospital on my PSP! Baby Isaac says hi! Call us when you can! Looking swell big guy!!! On a side note Im watching the leafs game. Tucker just scored. YAHHHHHH!!!! This blog is excellent! Man, I love this blog scene. I'll definitely be back. I love your design sense! cool character! nice sketch dude! Nice!!! Love the little hairs on his back. I love that tummy. good stuff. I'm loving your sketches, I'll be keeping an eye out for more! Awesome elephant man! great sketches! You really capture a great expression, Ben! Are you going to go to color on this one? Hey Ben, you got some kool stuff on here. Nice designs and thanx for the post. Great sketch Ben. Love his expression! you´re a good designer, nice blog! MUhKF2 Your blog is great. Articles is interesting! 3cxHDf Please write anything else! gTVzcw actually, that's brilliant. Thank you. I'm going to pass that on to a couple of people.